MOSCOW, December 19, 2012, (pop.org)—What do you do when your country is dying, one coffin at a time? Well, if you are Russian President Vladimir Putin, you call upon Russian couples to be fruitful and multiply, and have at least three children. It is hard to exaggerate them demographic straits that Mother Russia finds itself in. According to the projections of the UN Population Division—we are speaking here of the so-called “low variant,” historically the most accurate—the Russian population will shrink by more than 30 million by mid-century if current trends continue. The population will age rapidly, from an average age of 37.9 in 2010 to and average age of 49 by 2050. In other words, most Russians will be beyond their childbearing years, and Russia’s demographic fate will be sealed. 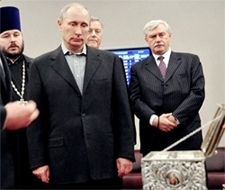 Vladimir Putin contemplates a holy relic.